This recipe is my re-creation of an occasional lunch entr�e served at the beach restaurant at Le Club 55 in St. Tropez. It requires very little cooking and is served cool, so it's a perfect summer dish, either as a dinner entr�e or a main dish for a light lunch. But there are a few techniques you will need to master in making this dish. First, you need a good mandolin to slice the zucchini into almost paper-thin strips. You'll need enough shallow ramekins to form individual servings. And you'll need an experienced hand with seasonings because there are no exact quantities in this recipe. The goal is to create a sweet, light and feminine dish with cumin giving it an unexpected twist. Crumble about 1/2 cup of mild, unflavored, fresh goat cheese into the bowl of a small food processor. Add about 2 TBS cr�me fra�che and process until smooth. The mixture should be neither runny nor hard -- just barely spreadable. Finely chop (by hand), a mixture of parsley, marjoram and chives (about 1 TBS total). While the goat cheese mixture is chilling, slice 1 long zucchini lengthwise into about 14-16 very thin slices using a mandolin (it is NOT possible to do this by hand -- the slices will not be thin enough to lay into the ramekins). Saut� the slices very carefully in a tiny bit of olive oil until just tender (about 15 seconds per side) and drain on a paper towel. (The cooked slices are very delicate. So you need to handle them carefully to avoid breaking apart.) Set them aside until you are ready to form the individual ramekins. 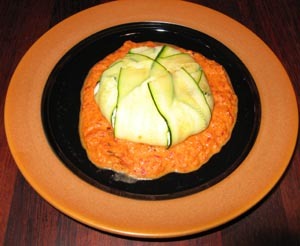 De-seed and remove the skin from one red bell pepper by placing it under the broiler until charred. (I also added one red jalapeno, charring off the skin in the same way, for a bit more kick). After removing the charred skin, process the flesh into a smooth paste using a food processor. Add 2 TBS cr�me fra�che (more or less) to create a smooth sauce. 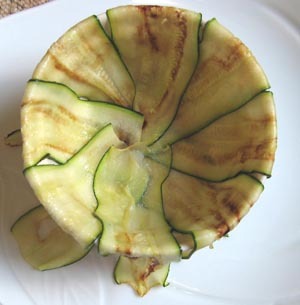 Very carefully arrange the saut�ed zucchini slices in an overlapping pattern in individual ramekins that have been very lightly coated with olive oil. (Ideal ramekin size is 3" diameter x 2" high. The ramekins need not be heat proof.) Tuck the slices snuggly into the corners and drape the excess over the side. Fill each ramekin with about 1/3 cup of the herbed goat cheese mixture and bring the overhanging portion of the zucchini slices over the top, so that the top of the cheese mixture is completely covered. Pat down gently with your knuckles. Refrigerate for at least 2 hours to firm up the cheese mixture again. When ready to serve, heat the red pepper coulis in the microwave until just tepid (about 30 seconds) and spread about 1/4 cup on each individual plate. Invert the zucchini/goat cheese packet onto the coulis. Garnish with a sprig of chervil (optional). Serve with a good ros�.